While the sky is the limit when it comes to DIY, the most common ways to enjoy the Guytronix tube amp kits are: (1) use our chassis, and plug into your favorite extension cab. 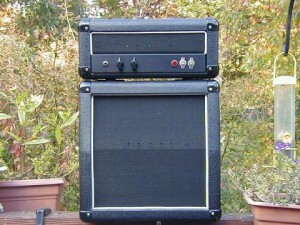 (2) Find and re-purpose a cheap “donor amp” – either a combo or a head. (3) Build or purchase a custom combo cabinet. Click Here to check out our made-to-order custom combo cabinet. Otherwise stay right here because here we are going to talk about re-purposing junky solid state amps. Think of it as something like putting the 427 cu in big-block V8 from a 1969 Chevrolet Camaro ZL1 into a Yugo. While nearly any donor amp will do, there are some requirements – you’re going to need a chassis with minimum dimensions of about 12″ x 8″ x 2.” Fortunately for anyone who wants to source a donor amp, cheap old solid state junk is abundant. Where to start? Craigslist can be a great place to find cheap stuff. Finding a donor amp on Craigslist is fairly easy. Head on over to Craigslist.com and pick the city nearest to you. Click on “for sale > musical instruments – by owner.” Type in “Combo Amp” or the like, and click the link that looks like this “$$$” to sort from cheapest first. Using Craigslist to find a donor amp. 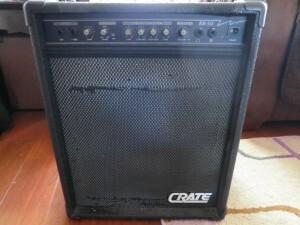 Voila, within a minute, I’ve found a Crate BX-50 Bass Combo that looks like a potentially good donor amp. First, this combo accepts a 12″ speaker – which is a good indication that the chassis probably meets our 12″ width requirement. Next I’ll do a google search for “Crate BX-50″ to see (a) what this amp costs new and (b) if i can find any specs about the chassis size. This appears to be an old discontinued amp, so I don’t see it’s new price, but I do see that the amps dimensions are 20.62″ H x 17″ W x 13.5” D. I have every reason to believe that this will be a great donor amp. The seller is asking $45, but considering the torn grille, and the fact that no one on earth would pay $45 for that, I’m reasonably sure I could get this for $10-$30. There are several dirt cheap new combo amps that make good donor amps. Call Musicians Friend and ask if they have any returns/used/open box items. This may cost a few dollars more than eBay or Craigslist, but the shipping is free and you should be able to recover some money by selling the guts. Somewhere, someone is looking for a part to fix their broken solid state POS. Remember to haggle. People are always selling their old junky solid state combos to GC. You might strike out at your local store, but you can search their nationwide inventory of used gear and they will ship their used cheap stuff to you for free! 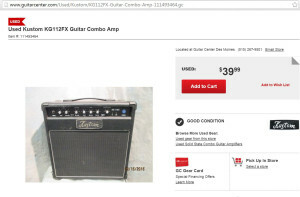 Go to guitarcenter.com and navigate to Home > Used > Used Amplifiers & Effects > Used Amplifiers. Sort by price (low to high) and look for a 1×12 or larger. I’ve just looked myself for a couple minutes and bada-bing I’ve already found not one, but TWO nice 1×12 combo donor amps for $39.00 with free shipping. PS – look for amps from outside of your home state, and save on sales tax. BE SURE THAT THE AMP IS UNPLUGGED! Please Click Here to see how to safely discharge all electricity from an amplifier. Please contact us with any questions. To allow adequate room for everything, we recommend using a donor amp with a chassis size of about 12″ x 8″ x 2” minimum. Most 1×12 combos will be good. You can get a ballpark size by measuring the width/depth at the top of the amp. It’s a good idea to measure the depth of the combo to make sure that any speaker you plan to use will fit. You should be able to get the dimensions of your speaker from the manufacturers website. You’d be surprised what people will buy on eBay. I was able to sell the guts from the Marshall Mini Stack pictured above for $50. I sold all of the guts, PC board, power transformer, switches, even the Marshall logo.